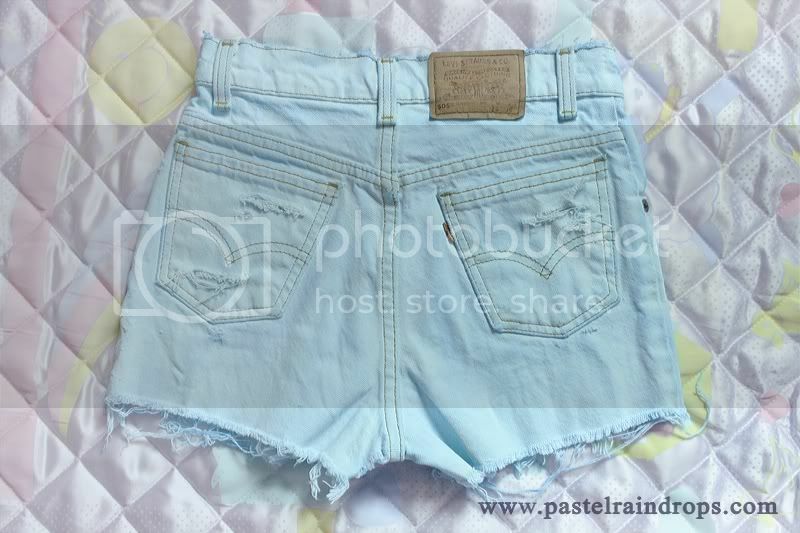 I told you I was going to be back with more about my DIY shorts and now here I am! First comes first! It's time to be destructive now, so take you pants and cut off the legs to a desired length, and they should be ready to go! 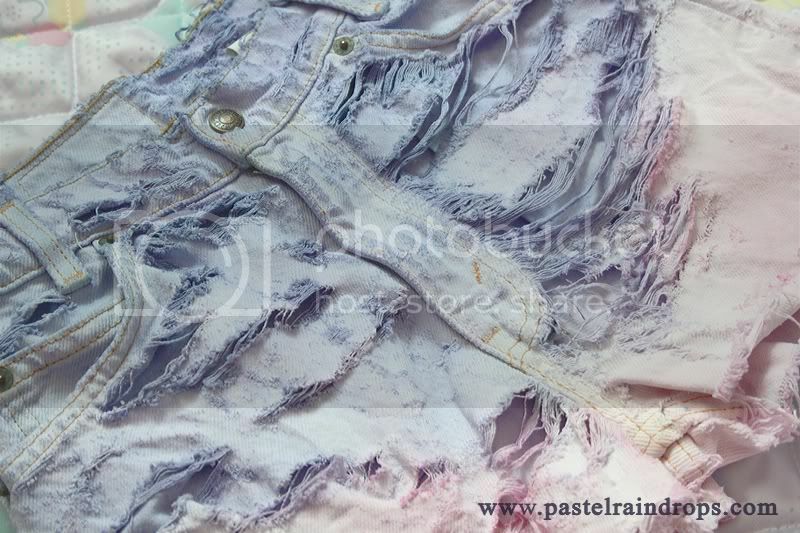 Before you start the real bleaching and dyeing work, you want to make sure to put on some old clothes to not get anything stained. You will also want to work in a well ventilated area, preferably outside, that you may also need to cover up to avoid damage of the surroundings. Once you prepared your workspace it's time to put on your gloves, grab your sponge and pants as well as the chlorine cleaner. As for the chlorine, please handle it with care! It's very acidly and can burn your skin or threaten your health in other ways. Because of this it's VERY important to wear gloves and maybe even a breathing mask if you have sensitive lungs. If you're unsure if you can handle the chlorine around better get somebody to help you out! I guess I don't need to point out that you're of course not supposed to drink it or get in direct contact with it anyhow. 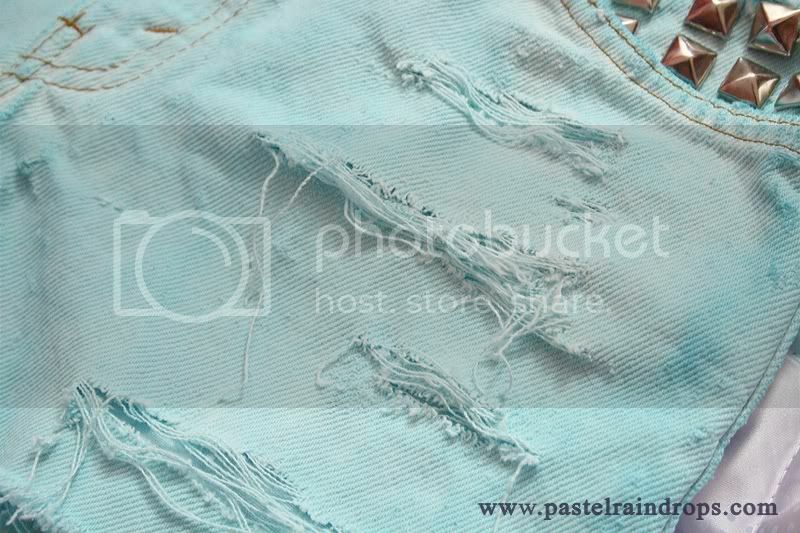 Pour some chlorine cleaner in a separate container and start applying it to the shorts with a sponge. Try to avoid the zipper as much as you can and if possible keep it closed! This will prevent it from getting stuck later on because the chlorine isn't exactly helping the zipper to work better. 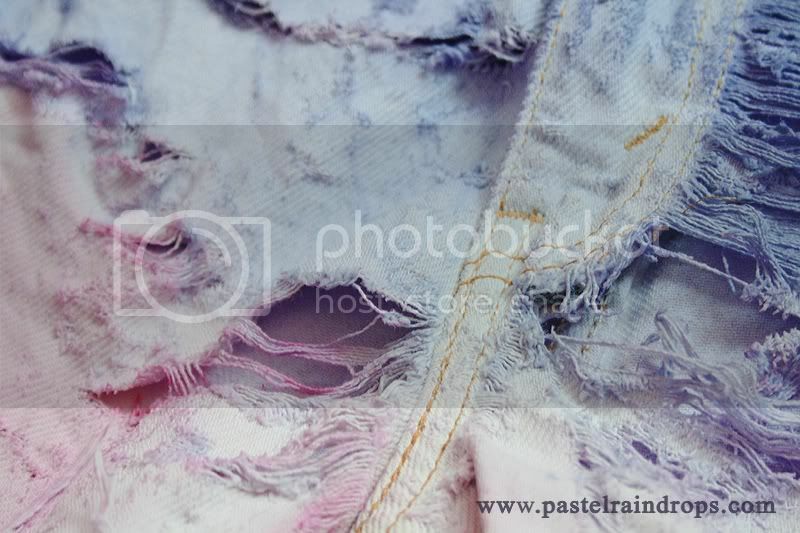 Work your way all through the jeans and make sure the shorts are evenly soaked with the cleaner. Now you'll have to wait for the fabric to become light enough, which can take up to one hour or even longer, depending on how dark your pants used to be. However, I advice you to not overdo it! 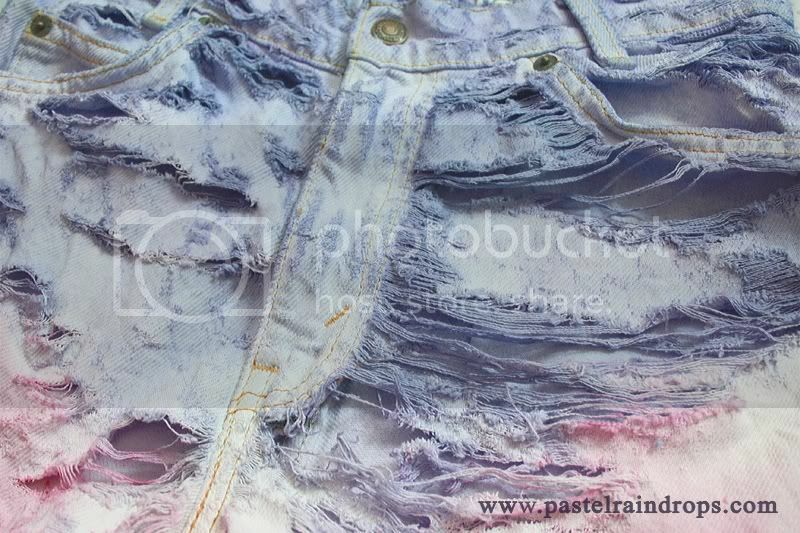 The chlorine is of course also damaging the fabric threads and if you let it bleach too long the shorts may break in the end. 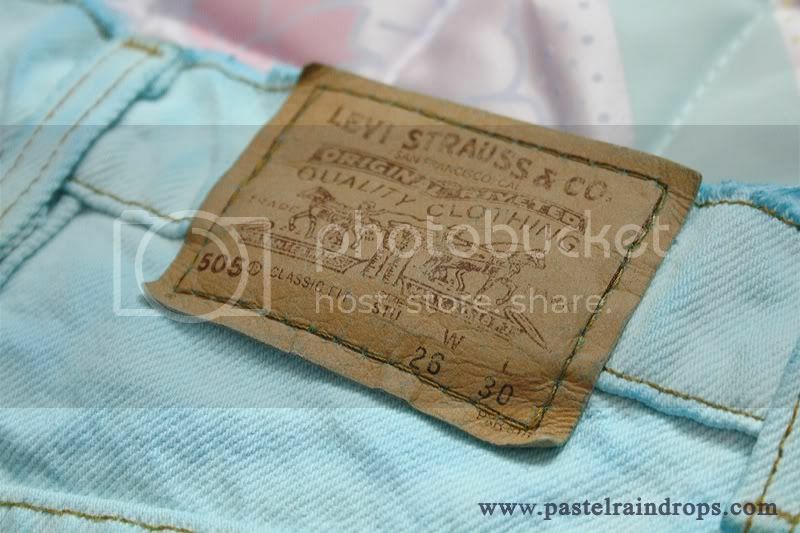 Also, the fabric tends to seem a little darker when it's wet, keep that in mind. 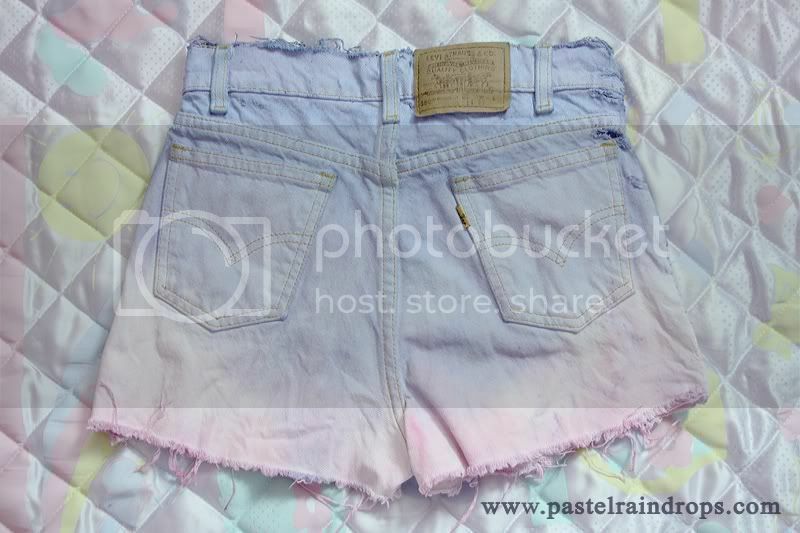 If your shorts have the desired brightness they're ready to be washed out. A hand wash will do for now, just rinse it nice with some cold water, mangle it a little and let it dry. After that you can also throw them in the washing machine. This step is optional but I found it quite useful to get rid of the chlorine remains and to see how much they can handle after bleaching them. 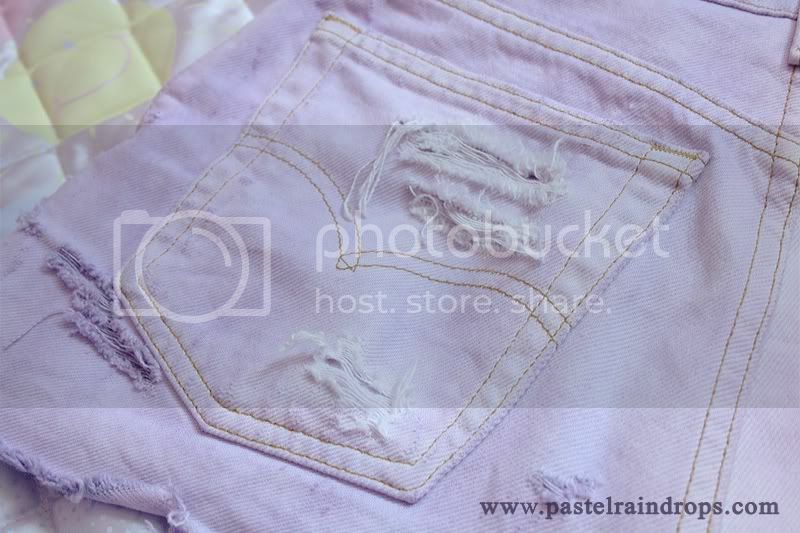 If you're unlucky and bleached for too long, the washing machine will rip your shorts apart which can end very bad. This shouldn't happen, though and except for one pair of shorts all of mine went through this step like a champ! Once all that is done you're ready for dyeing! There isn't much to say for this step. 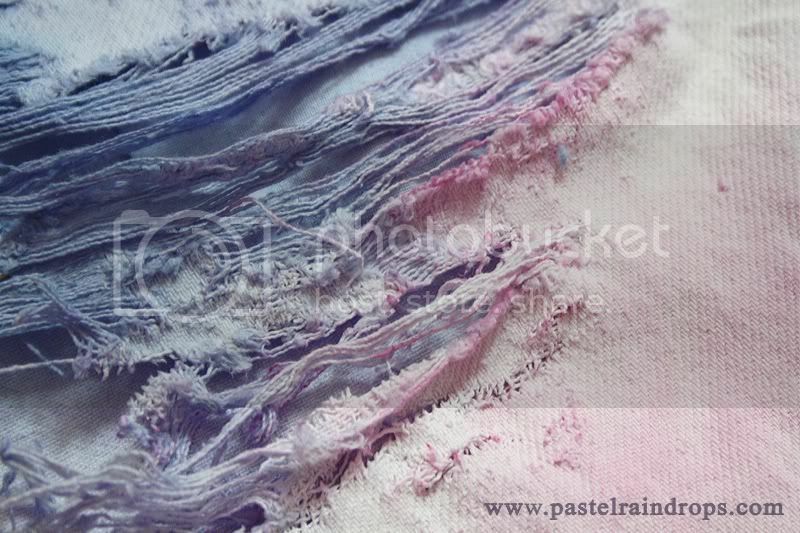 You pretty much only need to follow the given instructions from the fabric dye you'll be using and then dye away in whatever colour and patterns you want. When you're finished with this, again rinse out your shorts until the water stays clear and hang them up to dry. Now you're pretty much done, except you want some more fun. It's time for decorations! 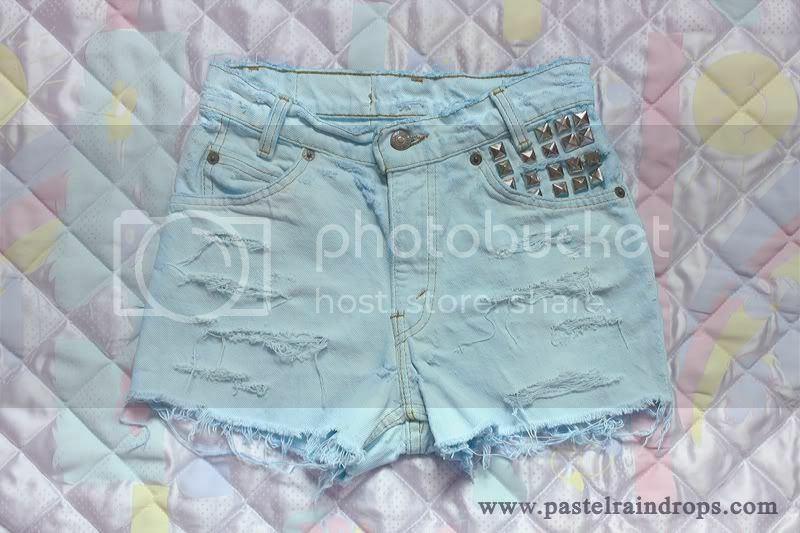 What I did was mostly to distress the shorts using a knife and a solid, wooden surface to put under the fabric, as well as to put on some studs for decorations. Again, you have absolutely no limits with this. I found it to be the most fun part because you could just play around with it. 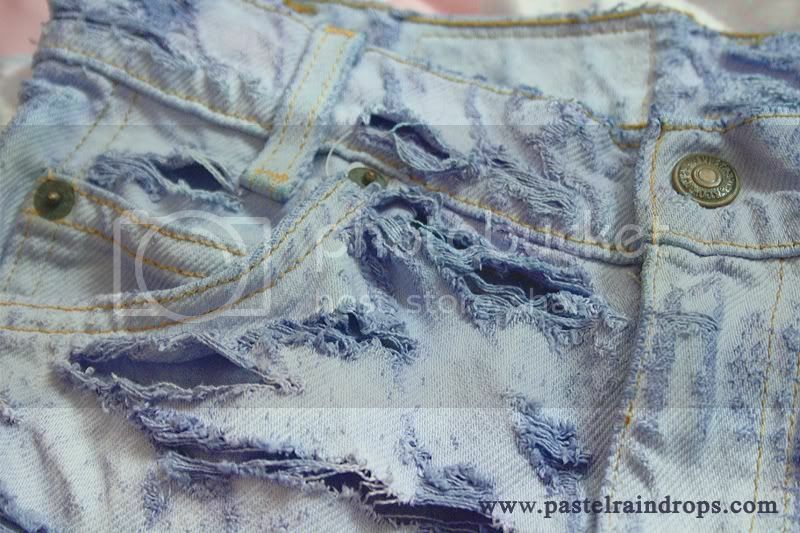 You could also get some fabric paint or glitter to get some more detail on your shorts. Or maybe sew on some appliques? This step is of course optional, though. You're also welcome to leave them how they are now, whatever you like best. 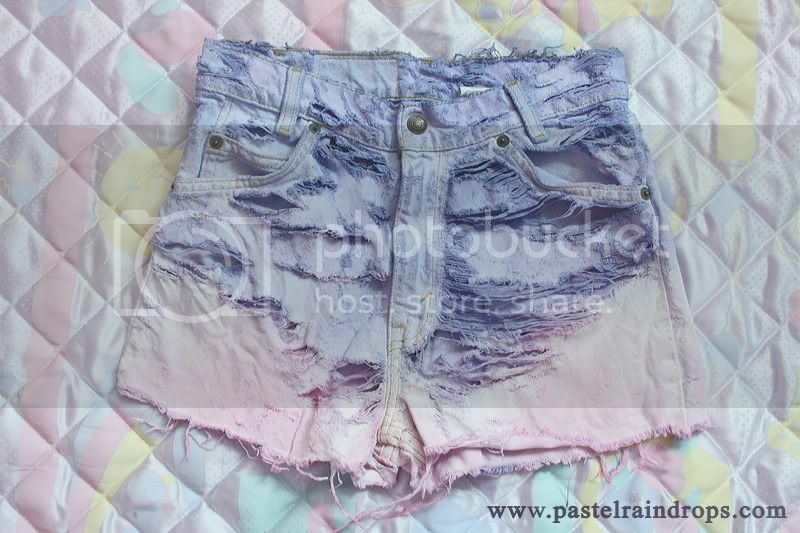 This is my pair of shorts, as you probably already know ♥ Of course in my favorite colours! I may add some more decorations to it sooner or later but I ran out of studs so we'll see. And a pair that is still looking for a new home and is up to sale! The only bad about these that they are very, very damaged. No, I didn't do this on purpose - this is what I meant as to why be careful with bleaching and what can happen in the washing machine. Surely looks quite cool but you can probably only wear it with some opaque tights or leggings underneath. But who knows, maybe someone still wants to give it some good love, regardless of how it's painful history. 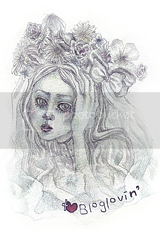 I hope you found my little 'tutorial' useful and try it out yourself! 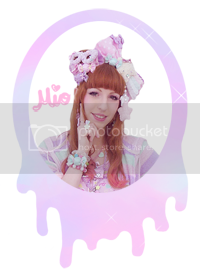 I'm also slowly working some more minor layout changes, like the new ava I already have in the sidebar, to make PR♪ an even prettier place. Stay tuned! With this I wave good-bye to you! So cute! 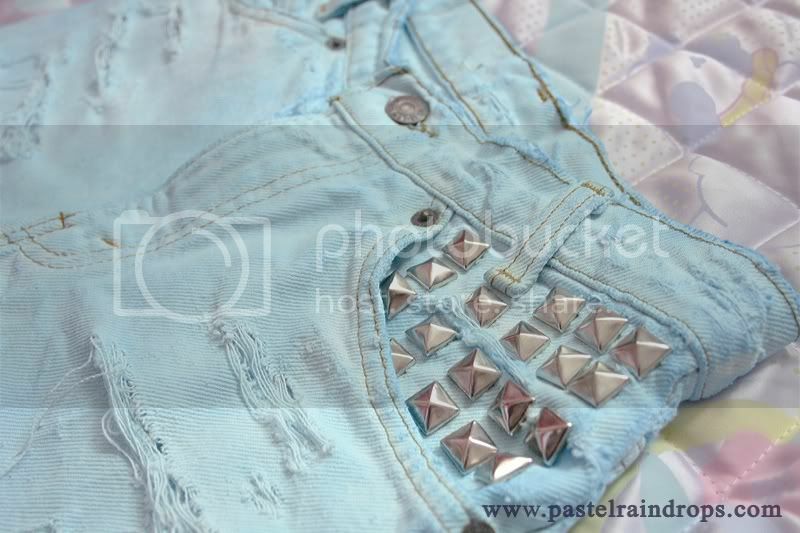 I am in love with those blue studded shorts. I am very inspired to make my own now! The half pink half purple are my favourite. 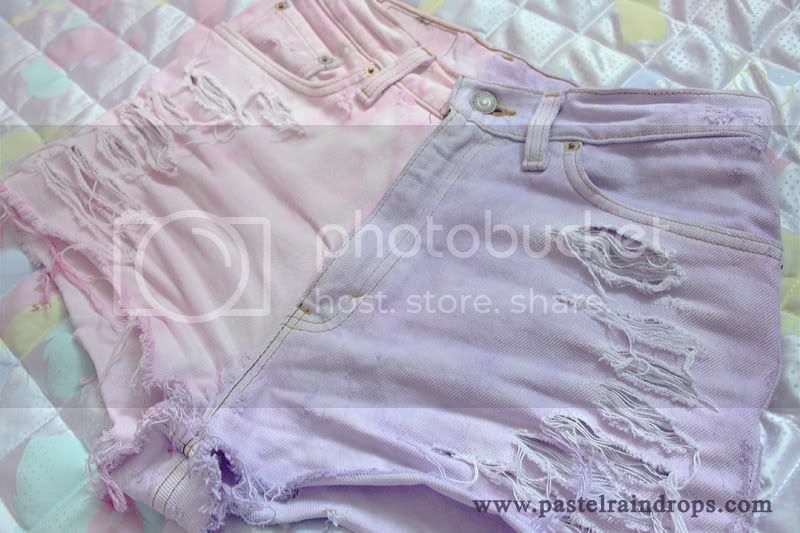 Wow, I saw the shredded pink and purple shorts and fell in love! I'd love to take them off your hands but I have a funny feeling they'd be way too small. I guess I'd be stuck making my own. 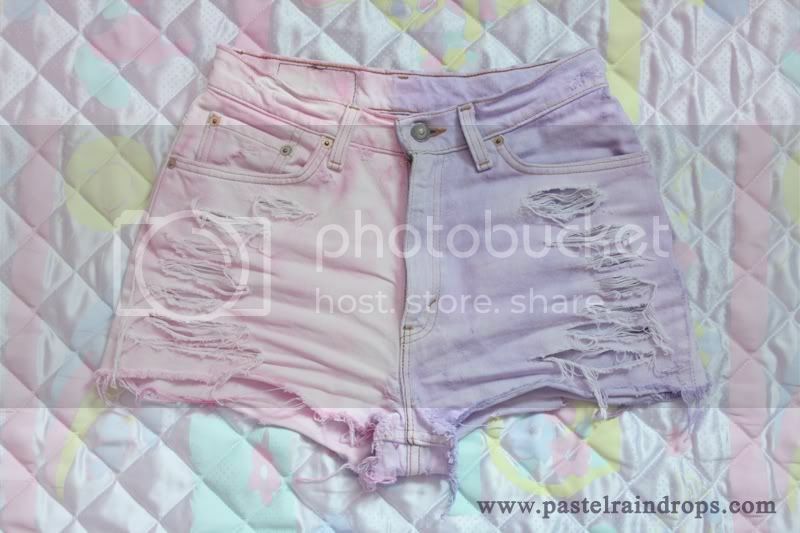 Yesterday I saw lots of pastel shorts in Primark, but yours handmade shorts are way better!!!! Did you use proper bleach/clorex to get them lighter? If so you shouldn't have problems with it because it reacts pretty well. 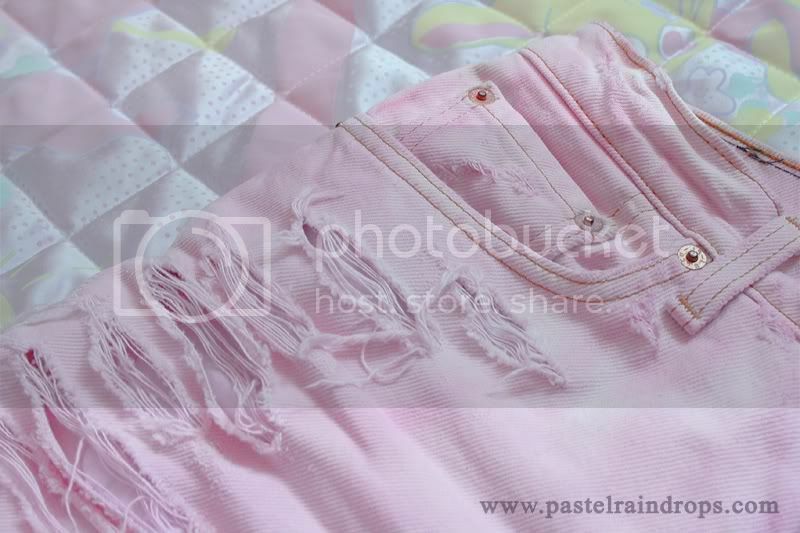 Or try leaving it in longer but be carefull to not overdo it or the fabric is going to break easier. How did you make them split? Dipping one half in dye at a time?